DETROIT – Coach Mike Babcock was hoping the Red Wings would make a better first impression for their new teammates. But that first game home after a long road trip often creates unavoidable pitfalls. “To be honest, I hope they don’t think we play like this, because we don’t,” said Babcock, about his team’s effort against the New York Rangers. The Wings were home for the first time in 16 days, returning from a recent six-game road trip that saw them go 4-1-1. But Wednesday, the Wings uncharacteristically turned the puck over far too many times for the coach’s liking. “I’ve never seen anything quite like it,” Babcock said. "I thought we looked like we’d been on a long road trip and got back and were wearing snowshoes." Fortunately, it was one of the new guys – veteran defenseman Marek Zidlicky – who made a winning impact. In his first game since being dealt from the New Jersey Devils on Monday, Zidlicky chipped a loose puck into the air and off the back of the Rangers’ goaltender to lift his new club to a 2-1 overtime win at Joe Louis Arena. The Red Wings were on a 4-on-3 three power play opportunity to start the overtime. Working in a diamond formation with Pavel Datsyuk in a net-front role, Zidlicky attacked the net from the right side when goalie Cam Talbot made an initial stop on Datsyuk. Zidlicky beat Rangers defenseman Ryan McDonagh to the loose puck in front of the net, lifting it into the air and over Talbot. As the puck descended it rolled off Talbot’s back and into the open net with 3:51 left. It was Zidlicky’s third career regular-season overtime goal, and his 16th game-winner, the first since the 2013-14 season finale against the Boston Bruins. However, the game didn’t start out so well for Zidlicky, whose first-period holding penalty led to the Rangers’ only goal of the night. 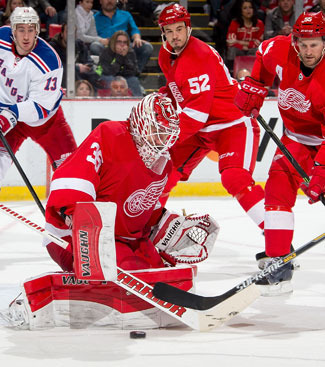 A bevy of defensive zone breakdowns allowed the Rangers to buzz goalie Jimmy Howard and the Wings’ net for most of the game, especially in the second period when New York held a 16-7 advantage in shots. In a tied game late in the third period, Howard made perhaps the headiest play of the night after McDonagh fired a rising shot from the point that went off the high glass behind the Red Wings’ net. Turning to track the shot, Howard swatted the fluttering puck with his blocker. The Red Wings other new guy, Erik Cole, who was acquired in a trade with Dallas on Sunday, finished the game with a plus-1 rating after he was on the ice for Justin Abdelkader’s goal that gave Detroit a 1-0 lead at 6:12 of the opening period. Henrik Zetterberg, who was playing for the first time since suffering from concussion-like symptoms, and Jonathan Ericsson picked up assists. Zetterberg, along with Datsyuk, also assisted on the game-winner. The win gives the Red Wings 83 points through 62 games and allows them to keep pace with Montreal (87) and Tampa Bay (84) in the Atlantic Division standings.